Nestled away between mountainous valleys southeast of Taipei City, lie the frothing hot springs of Wulai, a place noted for its transparent, odorless water. This geothermic byproduct is siphoned into public bathhouses, private hotels, and soaked-in naturally by visitors of all ages. Wulai is known as “hot and poisonous” which is a translation of the Atayal phrase kirofu ulai. Don’t let this name cast any admonition. These hot springs contain elements of alkaline sodium bicarbonate that are known to benefit the skin; however, water in this aboriginal sanctuary can naturally reach up to 80C. Taiwanese travelers make up the majority of the masses in Wulai, but hot springs are drawing in a large amount of foreign tourists more and more every day. 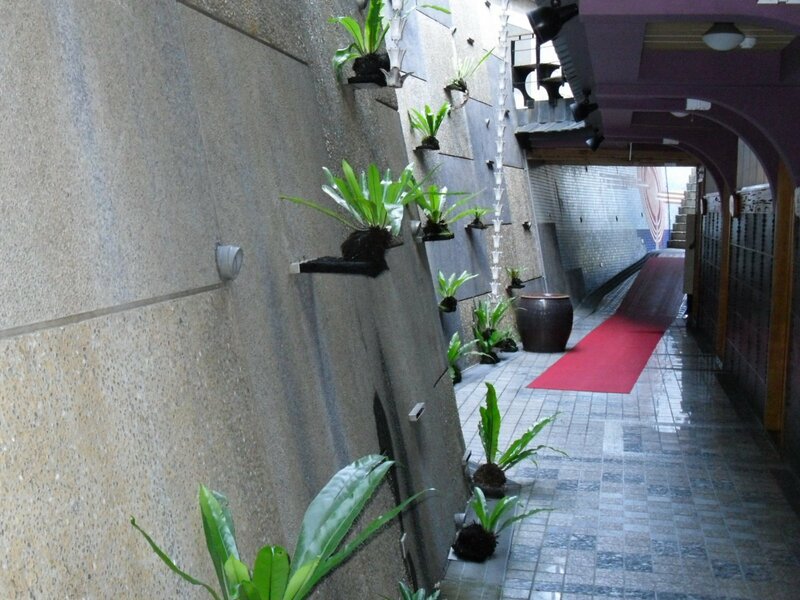 The most popular hot springs are private rooms which can be rented by the hour or in a hotel. Hourly rooms usually come equipped with a flat screen TV and accompanying mirrors that make the seemingly miniscule room appear larger in size. These rooms come in a variety of designs depending upon your taste, but for as little as NT$600 an hour, a luxurious marble or wooden designed room can place you in the proper period for relaxation. A number of the private hotel hot springs are settled upon cliffs overlooking the creek that creeps through the center of the small town. These completely wooden paneled rooms are accented with a touch of colonial Japan, fully equipped with paper sliding doors. Beyond these doors awaits a full room solely dedicated the hot tub and bathroom. The wooden features that accent this room, as well as the fine craftsmanship, makes sliding into this interlude of escape a smooth transition. If a cool night happens to blow its way in, crack open the windows and let the steam fade into the moonlit mountains beyond. Hot spring water should always be tested before going in and it is generally said that soaking intervals should be kept to 30 minutes. If you are bathing in an outdoors hot spring, it is important to shower before entering to maintain the water’s purity. The Nanshi Creek trickles down the mountainous town through a ravine. 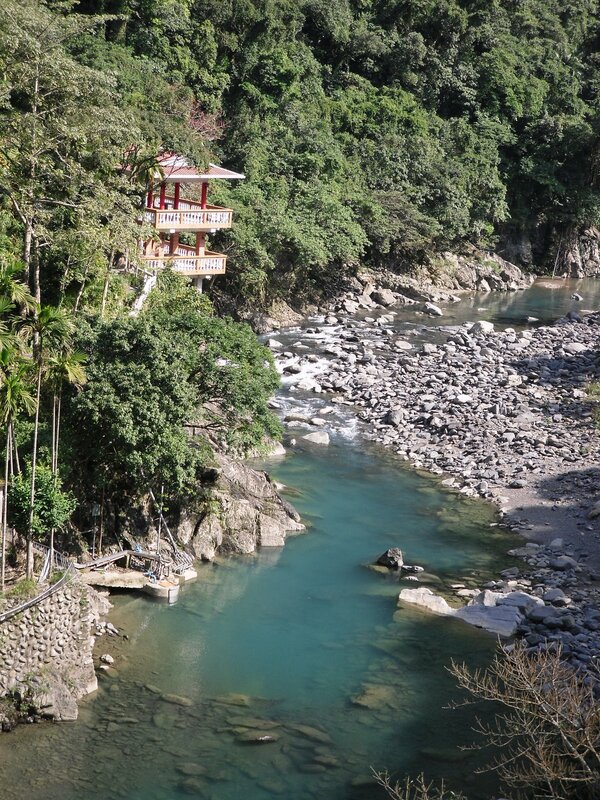 This nebulous creek can be followed upstream to the Wulai waterfall which you can walk to or take a small carnival train. The thunderous churn of water is only outdone by the jovial smiles of shop owners dotting the cliffside. The tribe’s traditional cuisine and handicrafts can be sampled conveniently in between most hot spring hotels. If you didn’t know any better, you’d probably guess from the number of street vendors selling sausages that these greasy links were the staple food; but upon further inspection, a vast array of homespun restaurants appear ready to dish out a variety of soups and noodles more customary to the locals. Only a slingshot away from Taipei City, Wulai’s incipient popularity is giving way to further hotel development. It’s not hard to see how this steamy get-a-way has become the perfect weekend trip for those looking to displace themselves from the bustle of Taiwan’s city life.